I am an alcoholic with this cursed disease. It is my master. It brought me to my knees. Although it boggles my mind and makes me unable to think. It causes my body, mind and senses to go slow. It makes friends out of people I don't even know. The terrible turmoil into which my life would go. Then it happens suddenly that there's never just a few. The drinks keep going down. I don't know the number. I drink until I'm in a drunken slumber. The hurt, the sorrow that all my life I wouldn't share. Hate suddenly rages forward from my mind and heart. My love turns to hate. I wish to tear everyone's life apart. I curse my friends who beside me stood. For alcohol now has taken my life, to rule. It brings out anger, jealousy and hate like a tool. I destroyed now all the things that I did love. Now I need help and power from the heavens above. To be able to quit the alcohol and leave it on the shelf. People who walk a different kind of street. Who'll stand behind me and don't want to leave. For I must defeat this this to which I'm slave. I must win, so a drink I'll not crave. First it is myself whom I must learn to love. For there are people who never stopped loving me. There are still many more trials in life's precious role. Now who is that wonderful, loving and caring person I see? My heart and soul will swell with pride, for that person is ME! Jerry Lien wrote that poem when his wife Janice engaged in a program for recovery from alcoholism. The program worked  for a few weeks. Janice began drinking again. Nothing could be done. When Jerry asked the police to intervene because he was afraid that she would injure herself and possibly others (Janice could never be persuaded not to drive herself home after drinking), they told him that they could do nothing  although they could easily have stopped her at any time after she left the bar and started up her car. Simply taking her driver's licence away would not have done any good, though. Janice didn't have one, and the police must have known about that, too. 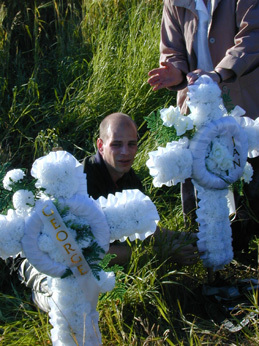 On August 8, 2000, on the evening of a beautiful warm and sunny summer day, Janice had a fatal accident, driving home after drinking in the bar with her father who had been visiting. 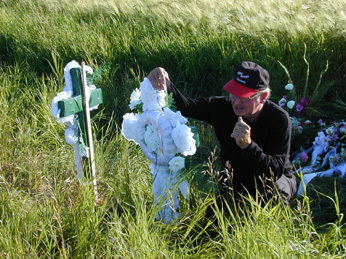 Both Janice and her father were killed on a country road about 1 — miles before arriving home. Janice had been driving. Fortunately, it was a single-vehicle accident and there were no other passengers. It was an accident that wouldn't have happened if it weren't for Western Chivalry. 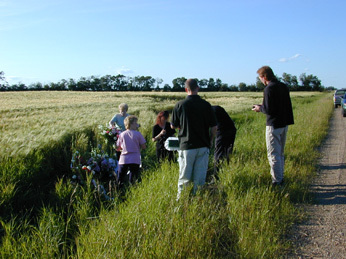 In remembrance  where Janice drove into the road-side ditch, to flip and roll the car in the field of barley beyond; there were no brake marks.